Ten more names to add to the long list of those shot within their schools on American soil. It has happened that recently, that the Police in Oregon haven’t confirmed who the shooter was or who the people killed or injured are. The insanity of the situation astounds me. I don’t want to talk about the man whose face is being plastered on the news as the potential killer. I want to talk about how. How has this happened? And my attention was peaked. I clicked through the link and over the next 5-10 minutes scrolled through the hundreds of shooting that have taken place in schools across the US since the late 19th Century. I would just like to add, if you did click on the link, that this is just the schools. Not shootings in the street, or domestic shootings – just schools. I was shocked, heartbroken and enraged that these shooting keep happening. I feel like the US is sitting on a sinking ship, watching the water come in and shouting “plugging the hole won’t stop it sinking!” instead they would rather throw people to their deaths and hope the load will get light enough that their ship will float. Gun control in the US is a hot topic – every single person has their own view. You have the big money powers like the NRA, you have gun control activists and then you have the average citizens. Everyone has something to say, everyone has the right to make their case but the urgency of the situation does not seem apparent to the US establishment. Whilst they sit and talk, debate and argue, more children and teachers are going to schools to learn and are never returning home. A good question. As someone from the UK it is hard to understand the political ideals of our brethren across the pond but here is my stand point. Gun control is essential. The constitution was written when the country was less populated, when men had to defend their land and their goods against all sorts. But, it was also a time when the most advanced personal weaponry could only fire a shot at a time. There was no automatic weapons available in the way they are now-a-days. An automatic weapon – in my eyes, is not for defines, it’s to cause damage and to maim and kill. Why do you need an assault rifle to defend your home? It’s ridiculous. It’s grotesque. Some argue that if the everyday person can not arm themselves, then they will be over run by armed criminals in swathes. That’s not true. If you choke the supple of weapons into the country it not only makes them harder to get, but it will also make them more expensive. I am in no way saying that banning guns will stop people being shot – no way. But it will stop unnecessary massacres in your children’s classroom by someone who has bought an assault rifle on the high street. I think gun laws should be tighter – the NRA did a poll in 2013 asking their members their views on what should happen with gun control and it read as follows. 92.2% of NRA members oppose gun confiscation via mandatory buy-back laws. 88.5% oppose banning semi-automatic firearms, firearms that shoot one bullet per trigger pull. 92.6% oppose a law requiring gun owners to register with the federal government. 92.0% oppose a federal law banning the sale of firearms between private citizens. 82.3% of members are in favor of a program that would place armed security professionals in every school. 72.5% agreed that President Obama’s ultimate goal is the confiscation of many firearms that are currently legal. This made for painful reading. Strengthening mental health laws to stop massacres with semi-automatic rifles, instead of banning the rifles. Why not do both? Why not ban semi-automatic rifles and then have stricter mental health laws for hand guns? I find it hard to believe. I also find it hard to understand why they wouldn’t want to register their fire arms? Let’s put it this way, is a cop is called to an address where there is a domestic fight going on – wouldn’t he rather know that there could be a weapon on the premises before he walks in and is another name to add to the list? The second to last point I find hard to comprehend as well. Instead of taking the weapon from the hand of the man who is going to your kids school, to kill your children and their teacher, they would rather place an armed official at the school door to relay the assault. Your kids are going to go to school feeling that every day could be their last. If things are desperate that your children need armed guards just to have an education, then don’t you think that something has gone wrong? They will live with a permanent fear. If that has not already been instilled by the countries lack of action. i don’t wish to dally on the political ins and outs of gun control in the US. I am a UK citizen and feel I am less educated on the subject that most, but what I can comment on is the media coverage of here in the UK. My friends whatsapped the news this morning that there had been a shooting like, no offence to them, it was every day news. Because that is what it feels like now. Many times I have heard a Brit say “Oh, another shooting” and pass it by. This is a serious issue people! We may seem out of the loop being so far away, but we are part of a worldwide voice that can happen a change. 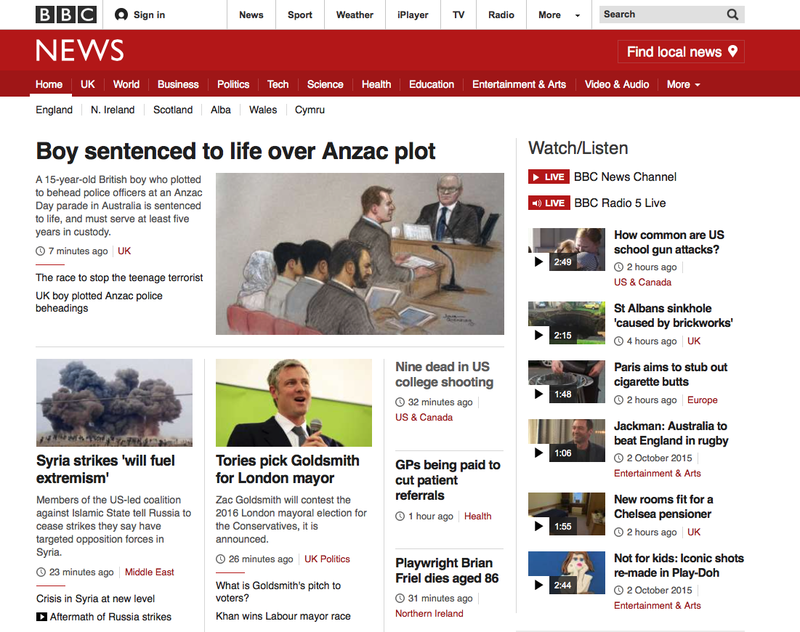 Right now the BBC homepage looks like this. The fact that a Tory MP has been nominated to be London Mayor is seemingly a bigger headline than the murder of nine people in Oregon. I for one, am an advocate of not publicising the name or motives of the shooters involved, as – especially with case – I believe a lot of it is to do with the attention, with the fame of being a school shooter. But, that doesn’t make the 9 people’s lives any less important. It should be reported. And, it is definitely more important than what the Tories are doing in their local politics. I feel like the UK can be a great ally for those fighting for gun control in the US, and I think it is potential that we should grab with both hands and do something with. In the end, this will no longer by a commentary on a crime in the US, but on the inaction of human beings to stop the murder of their own. Below are some links that you can use to find out more about gun control in the US. The first one especially offers a non-biased purely fact archive of information.